New structure could allow 16 of 32 teams reach the postseason. 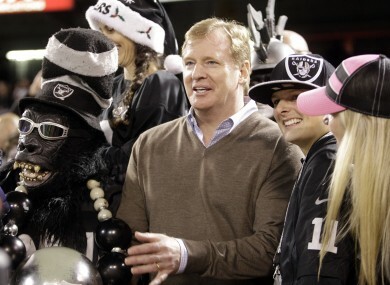 NFL commissioner Roger Goodell watches a game with Oakland Raiders fans last week. IN A MOVE that will divide many NFL fans, Commissioner Roger Goodell suggested the league is considering expanding the playoffs to 16 teams on Wednesday. Goodell, fresh from having the suspensions he imposed on New Orleans Saints players supposedly involved in ‘Bounty-gate’ vacated, was speaking after the December special league meeting which is held to discuss matters that will later be raised with the NFL Competition Committee. While Goodell admitted the Competition Committee has examined such proposals in the past, the benefits of more playoff games include keeping more teams, and fans, interested in proceedings late in the season as well as increased television money. “Right now we’re with 12 teams obviously. We’ll look at probably 14 or 16 teams,” said Goodell. However, while the move will be popular with perennial strugglers such as the Oakland Raiders and Tennessee Titans, it is unlikely to be welcomed by NFL fans who cherish the sense of achievement associated with being one of the 12 best teams in the league. Increasing the number of teams able to make the playoffs to half the league could also dilute the quality of competition as teams with a losing record would be much more likely to make the postseason. That has happened just once in the 12-team system, when the Seattle Seahawks claimed the NFC West with a 7-9 record in 2010. People would still watch the games, of course, and the NFL knows that. However, any decision must balance the short terms gain associated with increased viewing figures with the long term damage caused by devaluing a postseason berth. Other issues to be sent forward to the Competition Committee include the implementation of mandatory pads and outlawing of low blocks. Email “Goodell: 'NFL considering increasing the number of playoff teams'”. Feedback on “Goodell: 'NFL considering increasing the number of playoff teams'”.